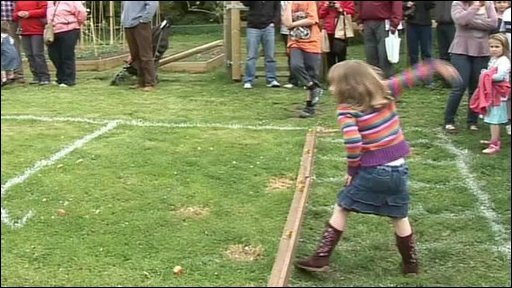 Villagers in Dorset have been competing to see who can toss their biscuits the furthest in the second annual "Dorset knob throwing" event. 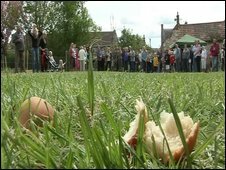 Competitors at the Frome Valley Food Festival, in Cattistock, on Sunday battled to see who could throw their Dorset knob biscuit the furthest. The event aims to support local producers. It was dreamt up after a Robbie Coltrane documentary featured villagers throwing Yorkshire Puddings. New records were set in each of the male, female and under 12 disciplines. The Dorset knob is a round biscuit historically made from excess dough. According to festival organiser Nigel Collins, the idea for the event came after seeing Robbie Coltrane's B Road Britain documentary on television, where the presenter witnessed villagers throwing Yorkshire puddings. "We thought, we can do better than that - we've got an excellent biscuit called the Dorset knob which is made locally, so we decided to throw the knobs instead," he said. The event was hotly contested with new records being set in each of the three disciplines. The men's event was won by Philip German-Ribon with a record throw of 26.1m (85.6ft). The female event also had a new record set, when Leah Stewart threw her knob 20.2m (66.2ft). And Solo Roper completed the record breaking clean-sweep, when he won the under 12s event with a throw of 18.5m (60.6ft).